Nice signing for Puma Golf in regards to signing Rickie Fowler to a Puma Footwear, Apparel and Headwear deal. I figured something was up when a few weeks ago Fowler was playing a Nationwide Tour event with some styling Puma threads. 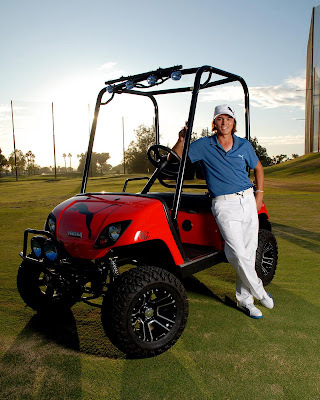 Check out the motocross-inspired golf cart Fowler received form Puma pretty sweet. Check below for the rest of the press release. Boston, MA (September 29, 2009) – Today PUMA® announced twenty-year old golfer Rickie Fowler, who just turned professional, will join the sportlifestyle brand’s roster of world-class athletes, among them: track and field star Usain Bolt, baseball player, Johnny Damon, and race car driver, Kasey Khane. The partnership, reached through an agreement with PUMA and SFX Golf, will make the sportlifestyle brand Fowler’s official supplier of PUMA Golf product on and off the course. He will also be featured in the Spring/Summer 2010 marketing campaigns for the brand, specifically for the golf category. To celebrate, PUMA welcomed Fowler to the family at the Soboba Classic Tournament by surprising him with a tricked-out, motocross-inspired golf cart sporting the signature PUMA cat against the bold PUMA red background. The cart features a roll cage, off-road tires, a push bar and a state-of-the-art stereo system. Fowler will use the cart during the Pro-Am round, while he plays in a foursome made up of his father Rod Fowler and famed motocross racers, Jeremy McGrath and Brock Glover. Very much the home-town favorite, Fowler will be cheered on by thousands of spectators during the tournament. Once a promising motocross competitor, Ricky turned his attention to competitive golf at the age of 14. As a student and golfer at Oklahoma State, Fowler made a name for himself on – and off - the course. As a freshman, he was the youngest recipient of the 2008 Ben Hogan Award, given to the nation’s top men’s college golfer, and he earned the coveted Phil Mickelson Award the very same year. For the past two years, Fowler has been ranked as the world’s #1 amateur and was also part of two Walker Cup Teams. This past year, he played in several tournaments on the PGA Tour, including two US Opens Championships. Fowler played his first professional tournament earlier in the month at the Albertsons Boise Open in Idaho. In October, Rickie will join Justin Timberlake and other celebrities in the Justin Timberlake Shriners Hospital for Children Open in Las Vegas. Rickie currently resides in Murrieta, California with his parents, Lynn and Rod Fowler and sister Taylor. During tournament appearances, Fowler will wear PUMA performance golf apparel, headwear and footwear with Smart Quill technology. Smart Quill technology features strategically positioned spikes to maximize grip, offering the best combination of traction, lighter weight and comfort in the industry. PUMA Golf apparel features Invisibonding Technology, an innovative way to eliminate stitching along the seams, which allow for easy of movement and enhanced on-course performance. Fowler joins more than 60 golf players worldwide who are supported by PUMA including, Geoff Ogilvy, Jeff Overton, Hideto Tanihara, Johan Edfors, Erica Blasberg, Anna Nordqvist, Jade Schaeffer and many more names and faces around the globe. With a design concept that focuses on individuality, newness and color, the brand offers key elements of versatility, lightweight and innovative technology. PUMA Golf is a perfect mix of performance and lifestyle and is worn by PUMA’s pro golfers worldwide and continues to bring attitude and change to a tradition-laden sport. For more information on PUMA Golf visit, golf.puma.com or on facebook at facebook.com/puma golf. That's great and all, but to really catch everyone's attention they should utilize a solar panel kit to not only look good, but do good for the environment.